Curious about how you can use iPads in an engaging meaningful way with your music education students? 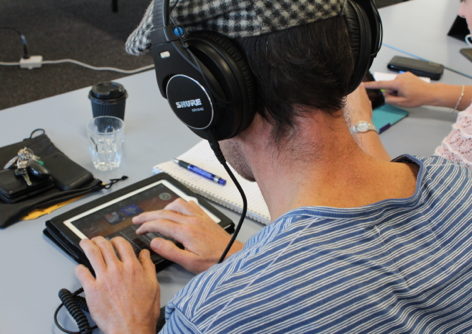 This hands-on workshop will walk you through some of the engaging iPad music projects from the extremely popular iPad Projects for the Music Classroom ebook. Using just a few inexpensive, creative apps we’ll look at easy, adaptable projects for students of all ages. There will be ideas for the one-iPad classroom as well as for 1:1 iPad programs and everything in between. We’ll start with a series of creative projects using GarageBand: how to compose a song using your own sampled name, how to transform the 12 bar blues and a choose-your-own adventure remix. Learn top tips for recording and arranging songs and creating radio shows or storytelling projects. Discover unique ways to explore sound, composition and performance with MadPad and finish with an “app-smashing” program music activity which combines storytelling, images, narration, and mood music. Learn how you can use Explain Everything for graphic notation, to present student learning, and to create digital portfolios. We’ll also explore musical iPad extras and accessories: such as the equipment needed to plug in MIDI keyboards, microphones and guitars into the iPad. Each participant will leave with a set of step-by-step workshop notes, links to online resources and further reading and a professional development certificate of attendance. What do I need for this workshop? When is the next workshop? Take a look at the Events page for upcoming workshop dates. No workshop coming up in your area? I’m currently taking expressions of interest from schools who would like to host this workshop for music teachers in their area. Please visit the Host An iPad Workshop page for more information.